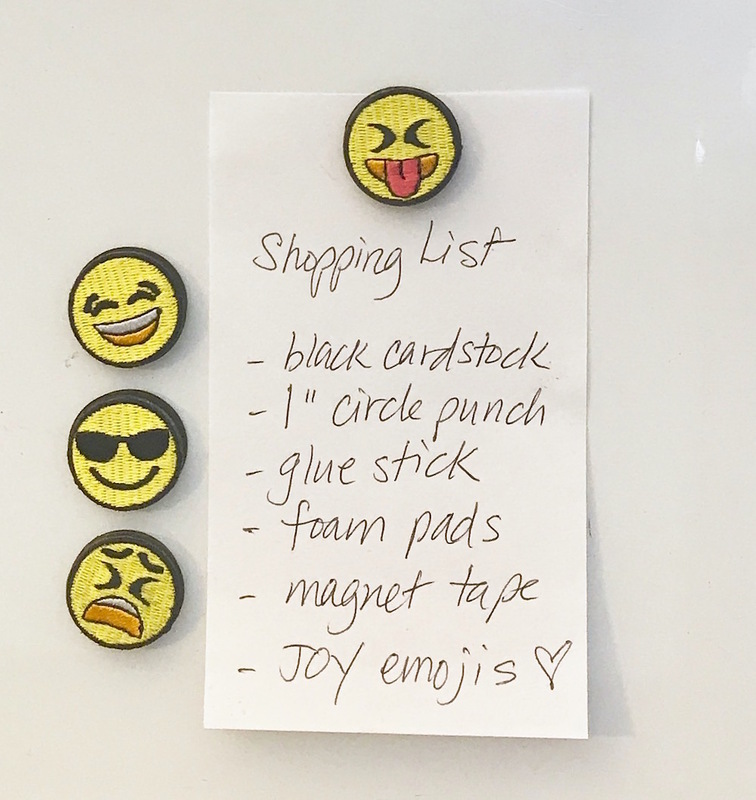 You can make this cute emoji magnet in about five minutes! 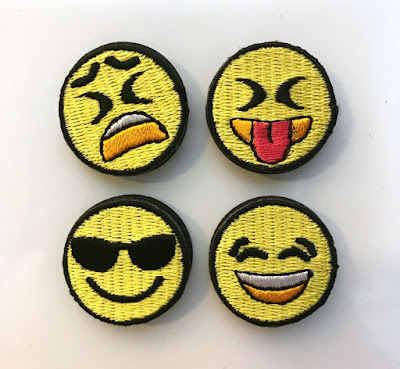 I really love the texture of these 1" Joy embroidered emojis - the adhesive on the back can be used as a stick-on or iron-on, making them super versatile. I like having lots of cute small magnets to hold notes on my fridge and the white board in my studio, so these fit the bill. 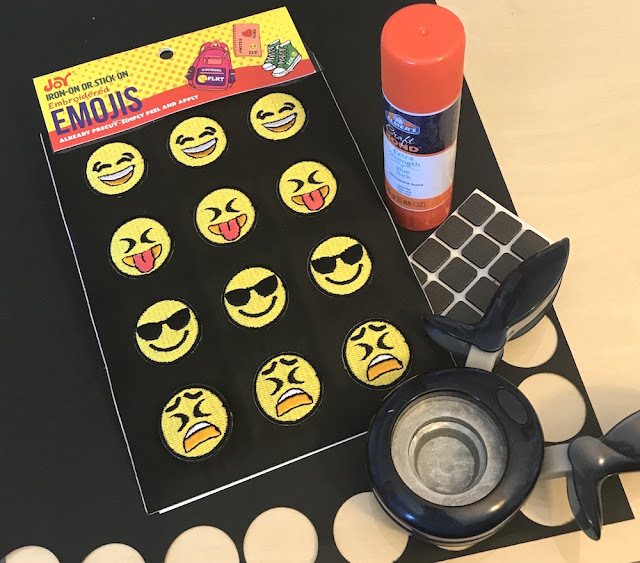 You don't need many tools or supplies to make these emoji magnets. Start by punching eight 1" circles from black cardstock. 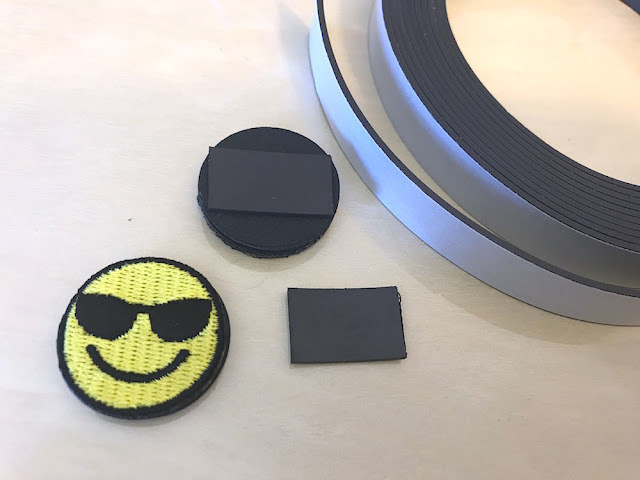 Glue them together in two sets of four each, so you end up with two nice and thick circles. 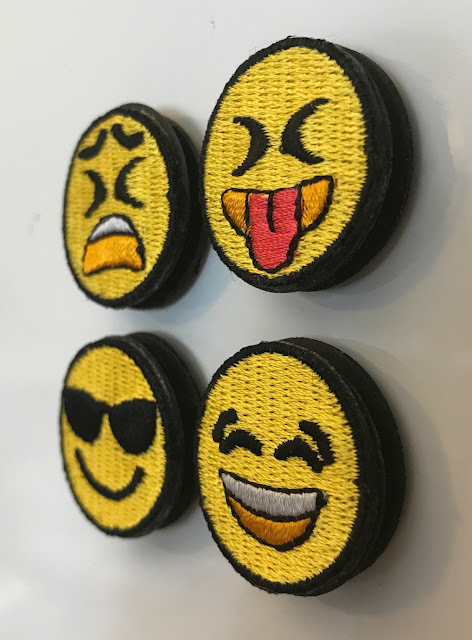 Stick a Joy embroidered emoji on top circle, and put a foam adhesive pad on the bottom circle. Stick the top and bottom together and you have a nice 1/4" dimension for your magnet, making it easier to pull on and off the fridge. 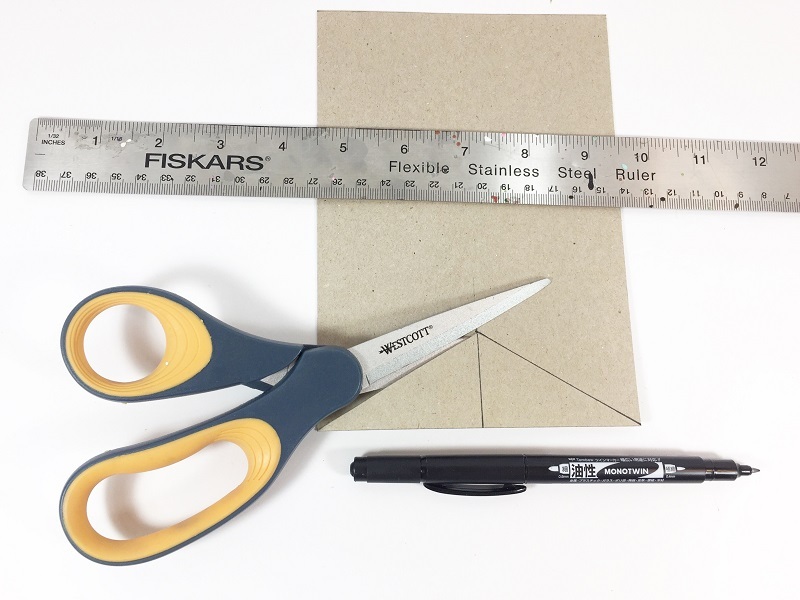 Add a piece of self-adhesive magnet tape to the back and presto! Your cute magnet emoji is done. 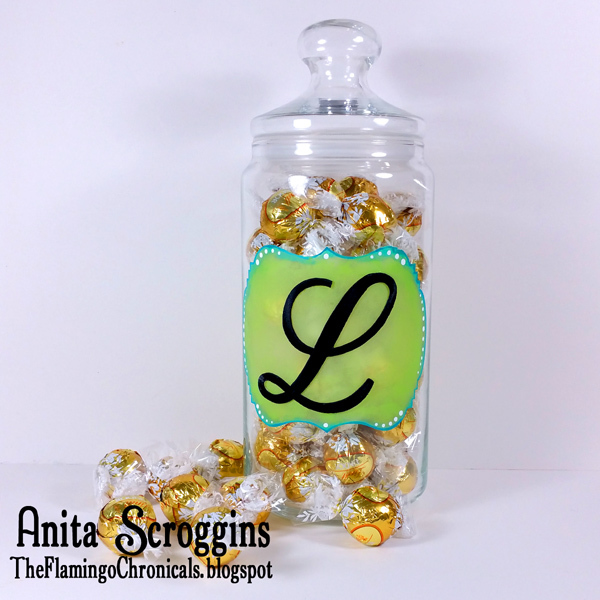 Your kids could make a ton of these for their school lockers, too. 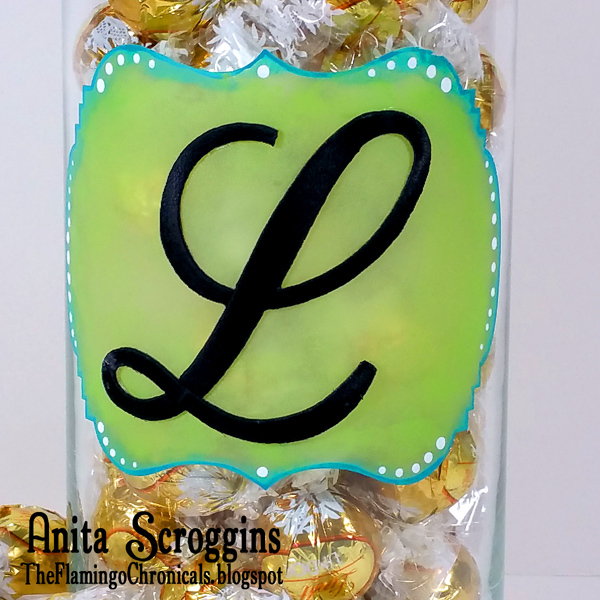 Make a whole set for a hostess gift - they're just too cute! Joy embroidered emojis are available at your local craft stores. 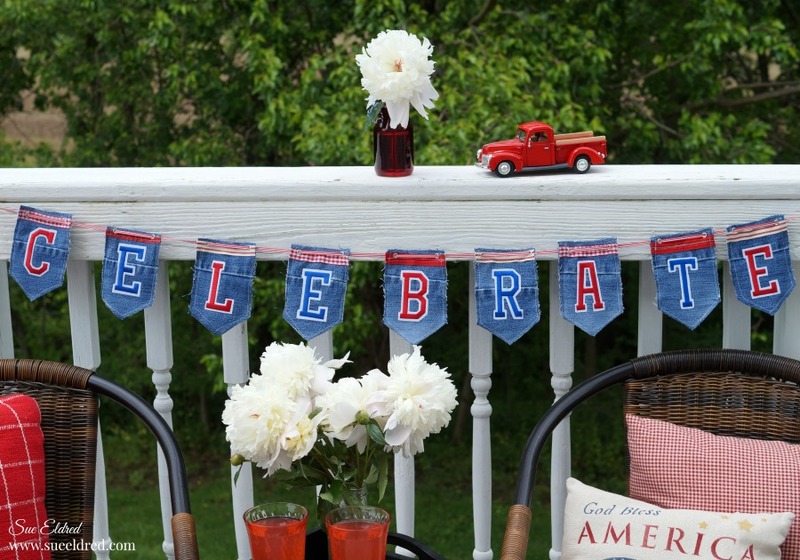 Create a banner using Joy Embroidered Iron On Letters and old blue jeans. 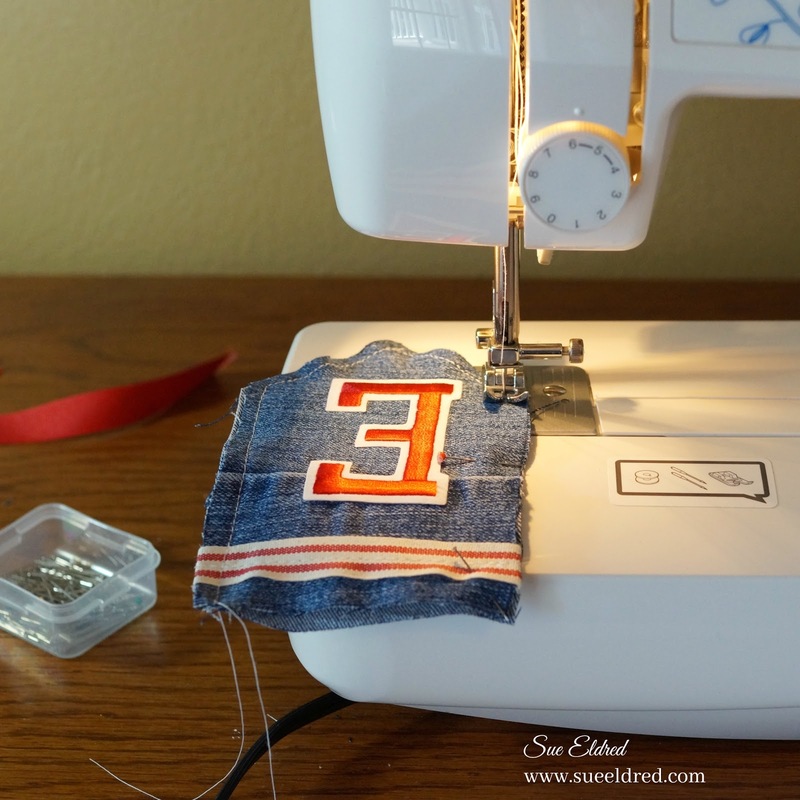 I started with an old pair of blue jeans and 3" Joy iron-on embroidered varsity letters in red and blue. 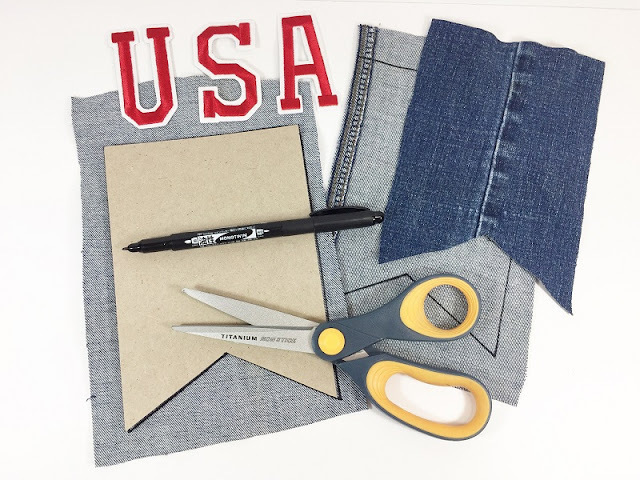 I created a 3 1/2" x 5 1/2" banner pattern using grid paper and traced it onto the jeans. To add a little interest... 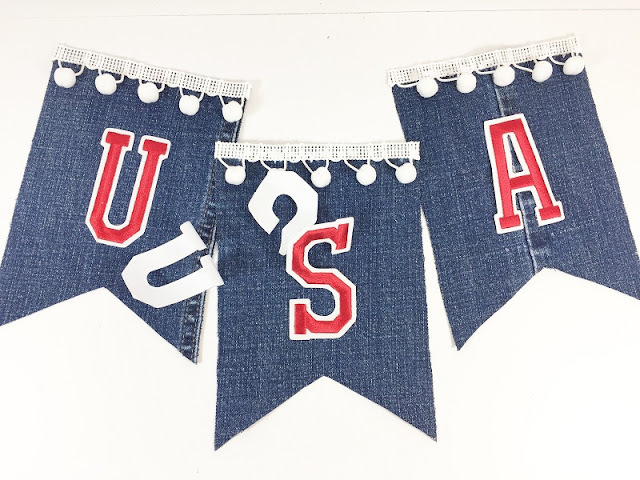 I incorporated the seams from the sides of the jeans to use for the front of the banner. For the word "C-E-L-E-B-R-A-T-E" I cut 9 banners for the front with seams and 9 plain ones to use to line the back of the banner. 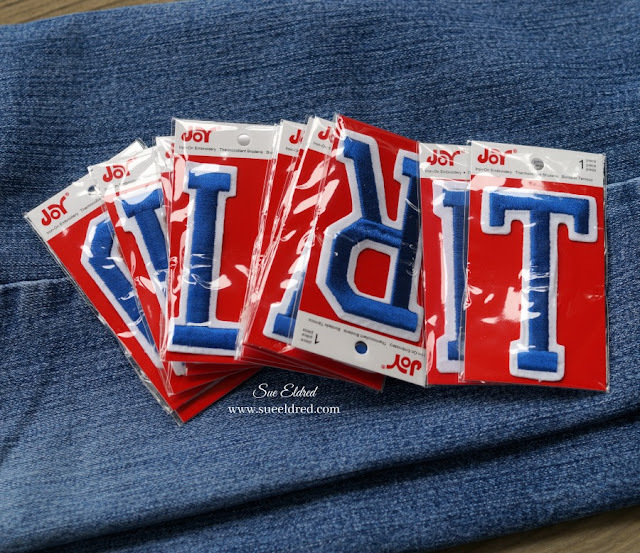 The Iron-on Embroidered Varsity letters are sticky backed so I placed them on the front of my banners before sewing. 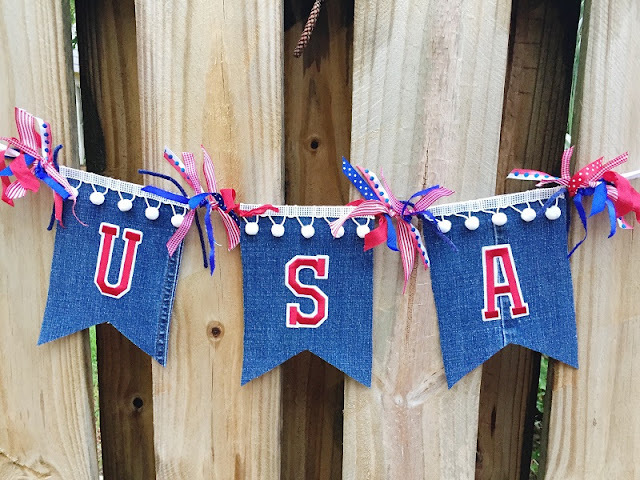 I sewed the ribbon scraps onto the tops of each banner, then sandwiched the ends between the front and a plain back and simply sewed around each banner with my sewing machine. 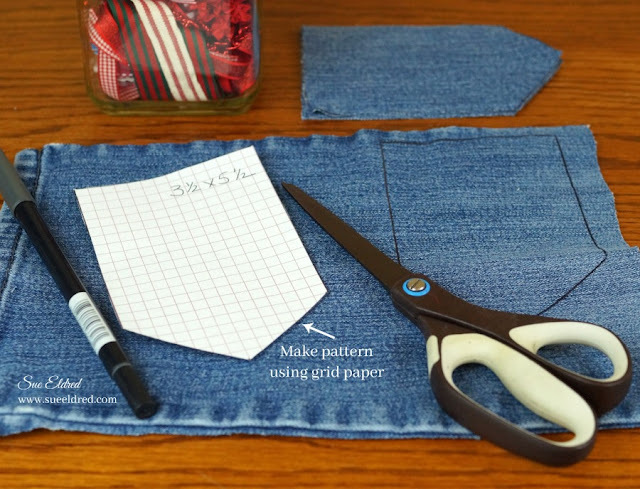 You could also glue the front and back pieces together, if you don't have a sewing machine. 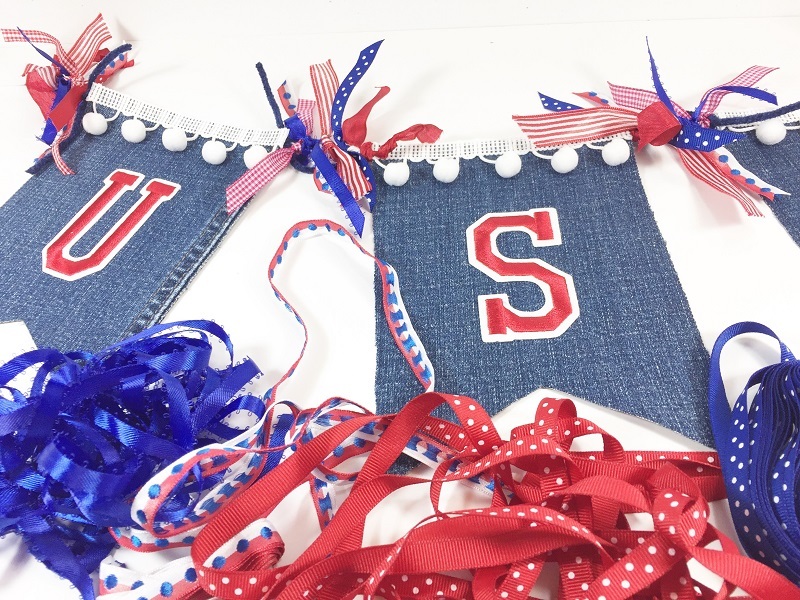 After I was finished sewing all my banners, I used a Crop-A-Dile to punch holes and add eyelets. 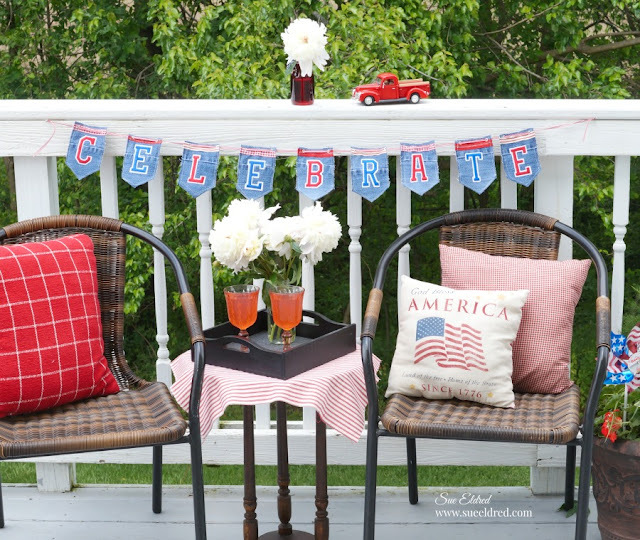 Use the banner anytime you feel like celebrating. 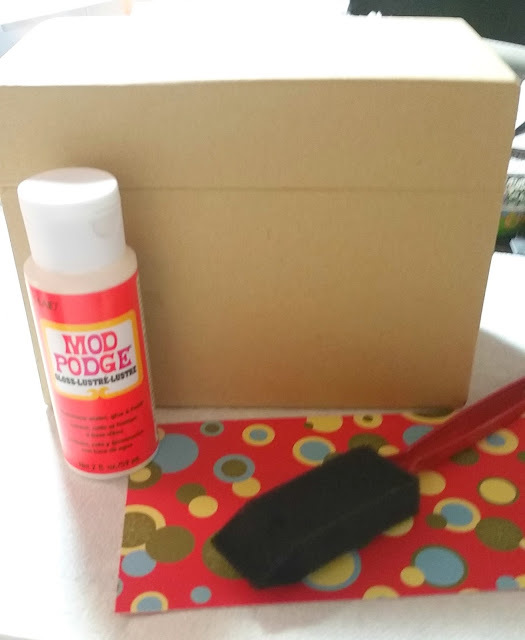 Happy crafty day! 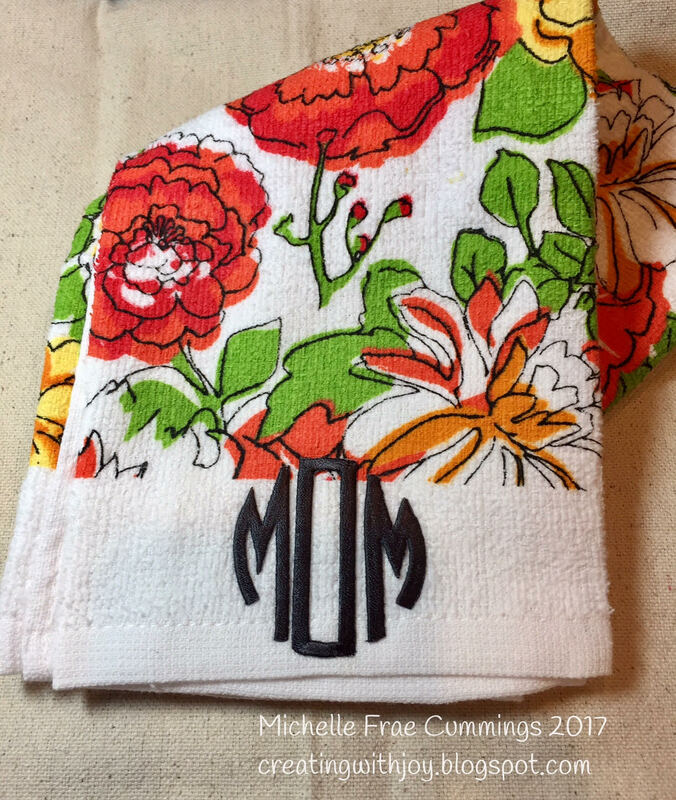 Here's an idea for quick and easy monogrammed napkins featuring Joy embroidered letters and stamping. I'm always shopping the clearance sections at my favorite stores and these natural linen napkins with hot pink lace trim were a real score at just 97 cents each! 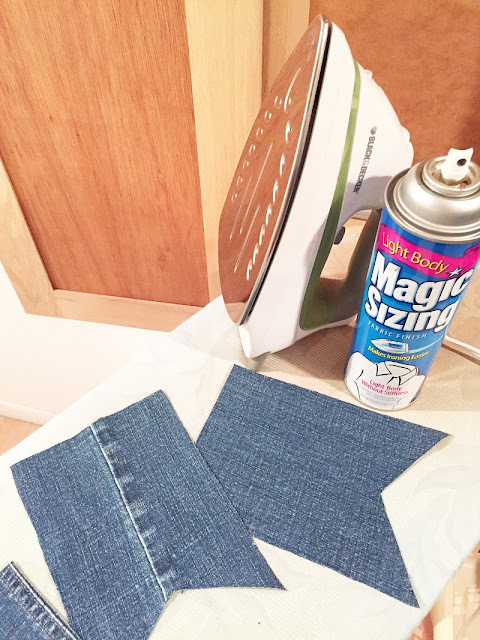 Wash and dry the napkins, then iron to remove wrinkles. 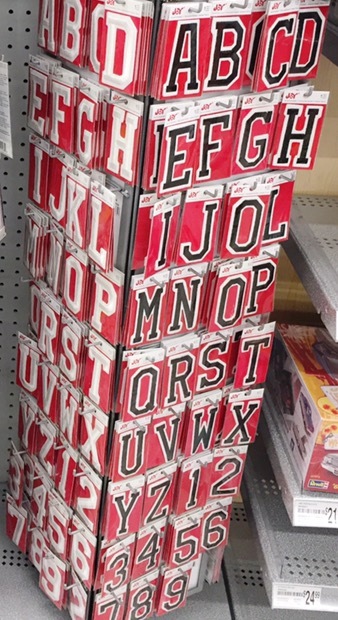 Select your Joy letters and set aside. 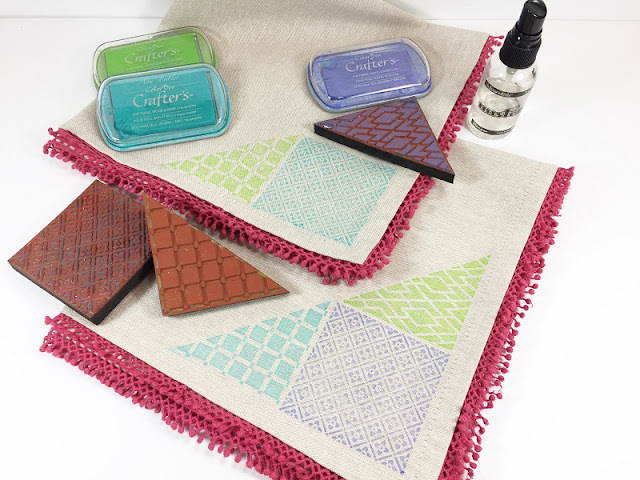 Gather a selection of rubber stamps and ink pads. After pressing your stamp into the ink, mist the inked area lightly with water, then stamp the image(s) onto the corner of each napkin. 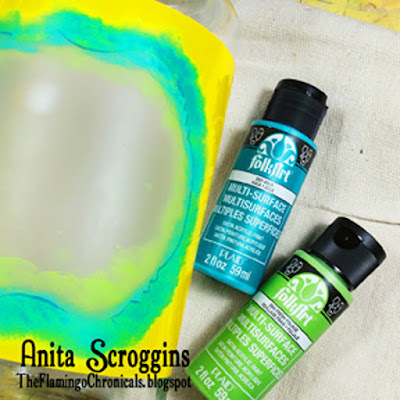 The extra moisture will help transfer more of the pigment on to fabric. Position a letter in the corner of each napkin on top of the stamped design. 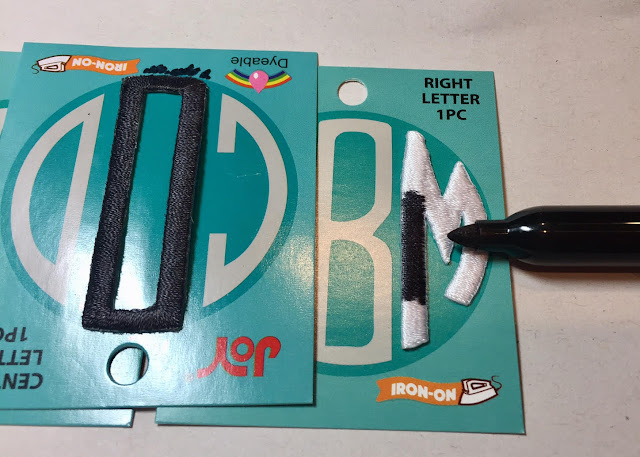 Iron on according to package directions. And you are done - it's easy as one, two, three! 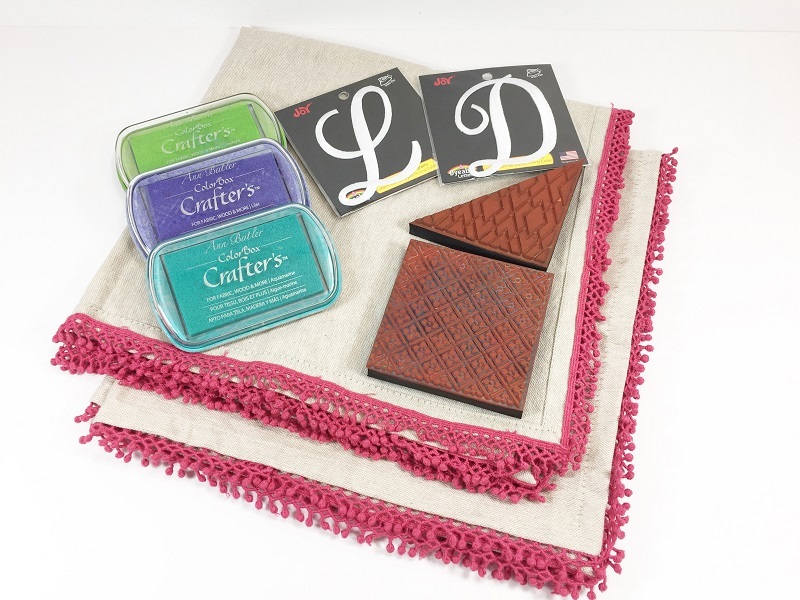 These napkins would make a great housewarming gift, teacher appreciation gift or wedding gift. Use my project as a jumping-off point to start creating with joy! 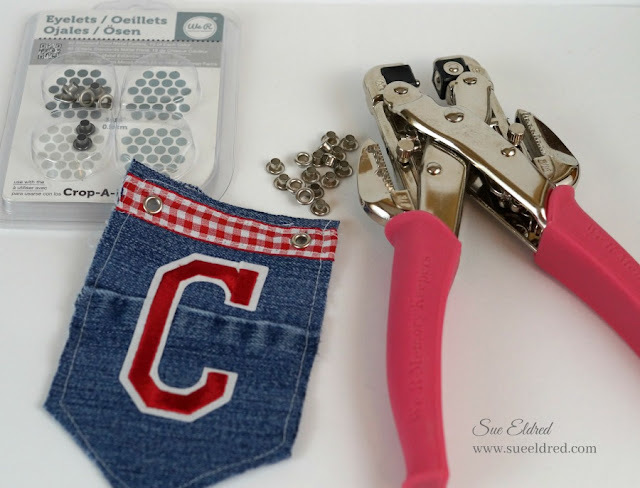 Joy embroidered iron-on letters, numbers and symbols are an excellent way to personalize anything and everything - the possibilities are endless. 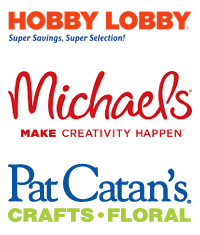 Find them at your local craft retailer in a variety of colors and sizes. Hello Crafty Friends! I have a sweet pillow idea for you. I moved to the state of Washington late last year and I'm loving it. Everything about this place makes me happy and I'm surprised by how I feel like I've finally "come home" when I never lived here before. 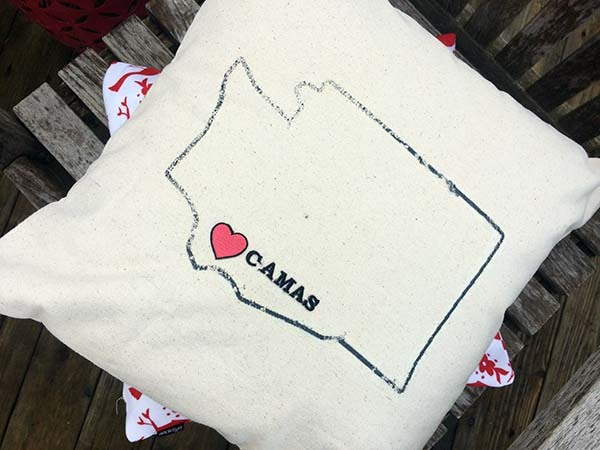 Of course, a new house means lots of nest fluffing, so I created this "Home is Where the Heart Is" pillow to not only decorate my new home, but also put my feelings about my new hometown on display. 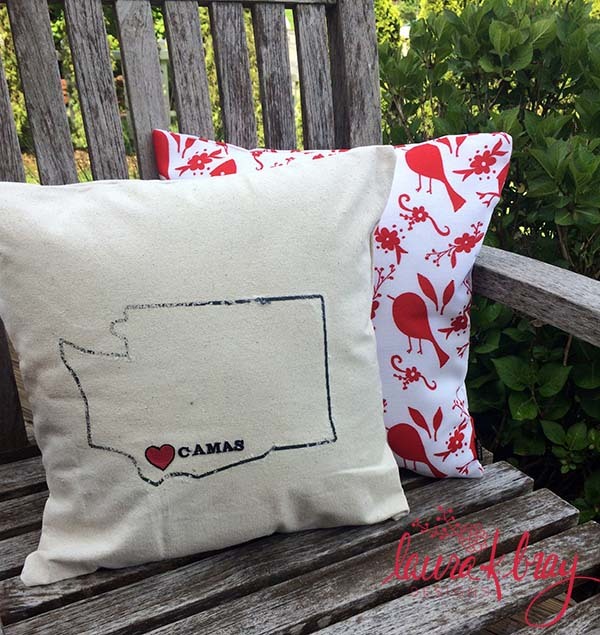 I am using this pillow on my outdoor porch, so I used my favorite fabric - a canvas drop cloth! You can buy huge drop cloths at your local hardware store. 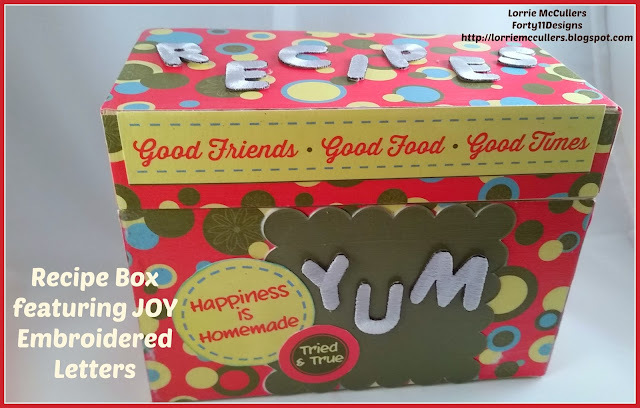 They are very inexpensive and very durable, so they are perfect to have on hand for projects like these. If you don't sew, just buy yourself a linen pillow cover and follow the same directions. Joy Classic Monograms - you can find Joy products in your local craft or sewing store. Using your favorite pillow pattern, cut out the fabric pieces. Download an outline of your state from the web. There are tons out there, just make sure they are copyright-free! Cut out your state. Be sure to to cut out INSIDE the state lines too. You can't iron-on the Joy patches over other iron-on images. Follow the instructions on the package to iron the image onto the front piece of your pillow. My image didn't transfer completely because I was using drop-cloth material. But there are no mistakes in crafting! I decided I liked the look because I was trying to get an old, farmhouse look and the image transfer "mistake" made that happen! 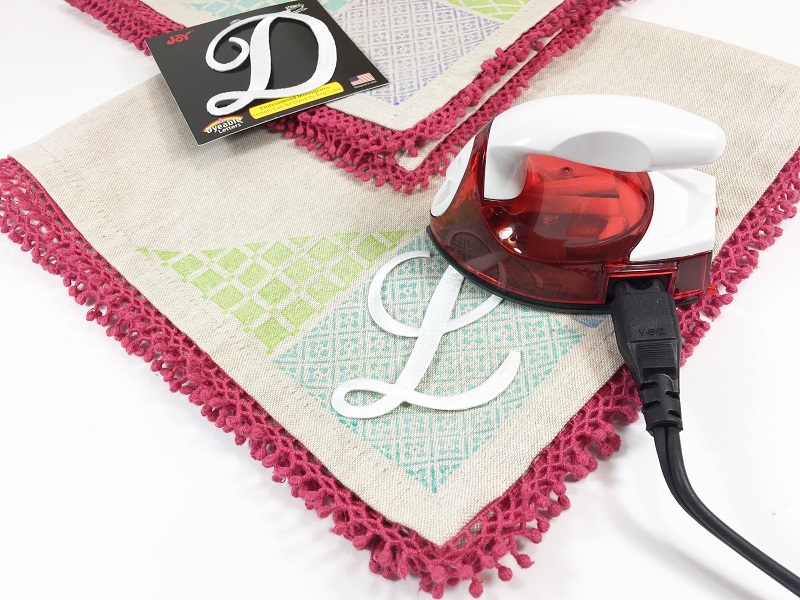 Iron your monogram letters, spelling out your city's name, next to the heart. 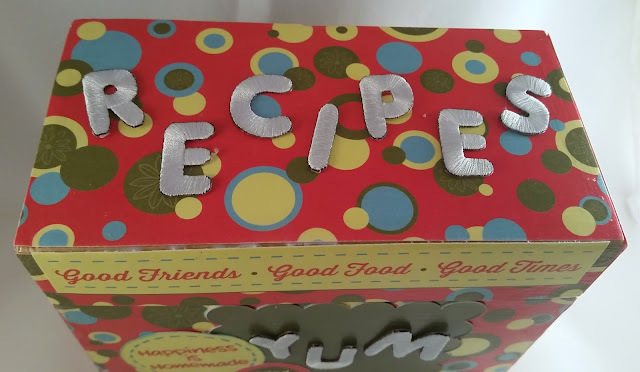 Be sure to also put a pressing cloth over the letters. 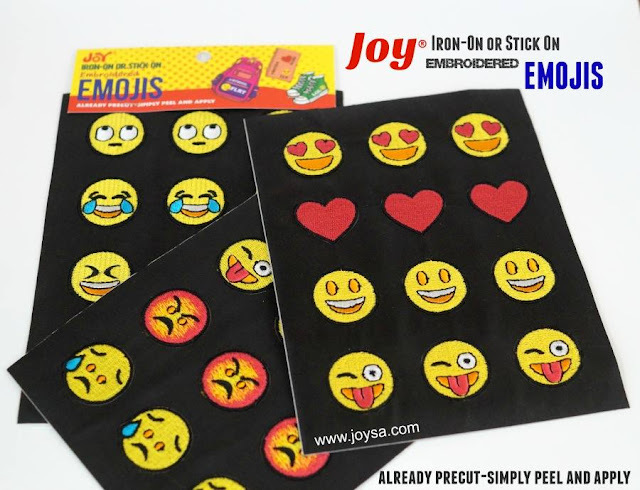 This will give you the best results when ironing on Joy products! Finish sewing up your pillow and enjoy! 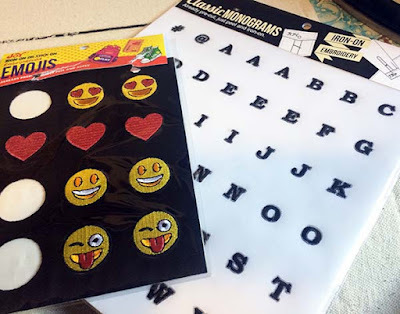 If you are worried about using an iron-on image, just use a fabric transfer pencil to outline the state image and then embroider it onto your fabric. 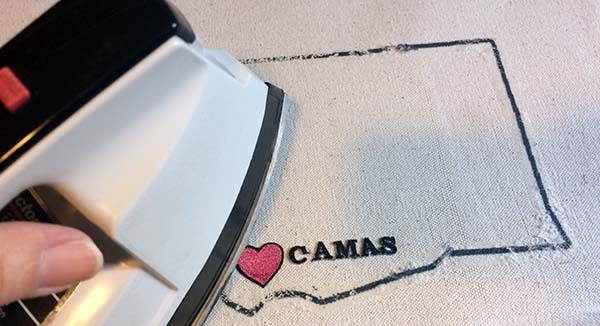 Whether you use the iron-on technique or a fabric transfer pencil, don't forget to flip the image before you transfer it or your state will transfer facing backwards. 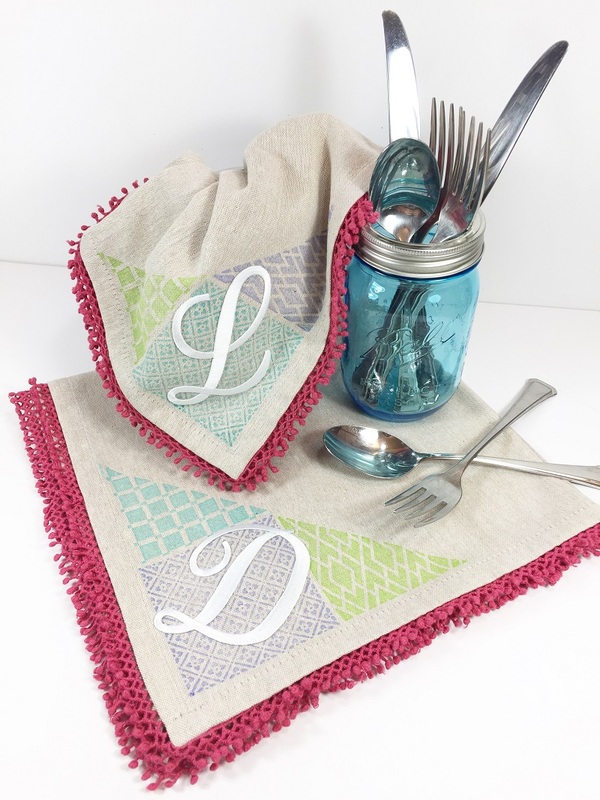 Here's a great way to add some class to a dollar store dish towel! Begin by coloring your letter with your markers. Then place a piece of parchment paper under the top layer of the towel. 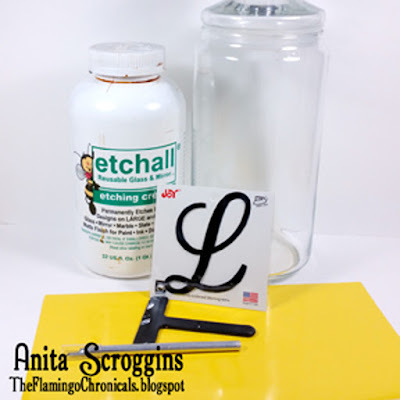 Arrange your letters, lay more parchment paper on top and iron them down, pressing firmly for 30 seconds at a time, letting the letters cool in between ironing until they are affixed to the towel. Emoji bottlecap jewelry is a quick and easy summer project for the kids, or you could even start your own little enterprise and make this jewelry to sell. This would be a perfect group project at a birthday party, too. 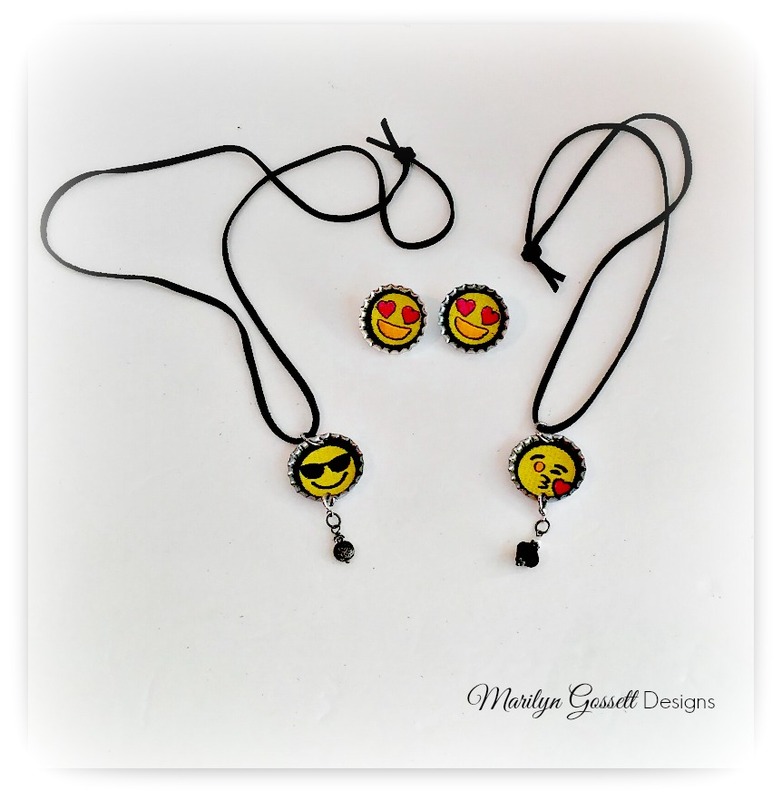 I am a grown -up (at least on most days...) and even I had fun making these quick and easy necklaces and earrings. 1. 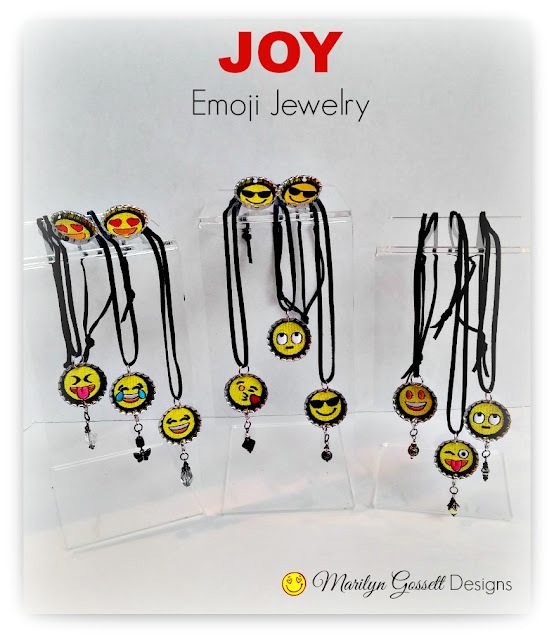 For the necklace, choose an emoji; peel it from the release paper and push it into the bottle cap with a little adhesive to secure. 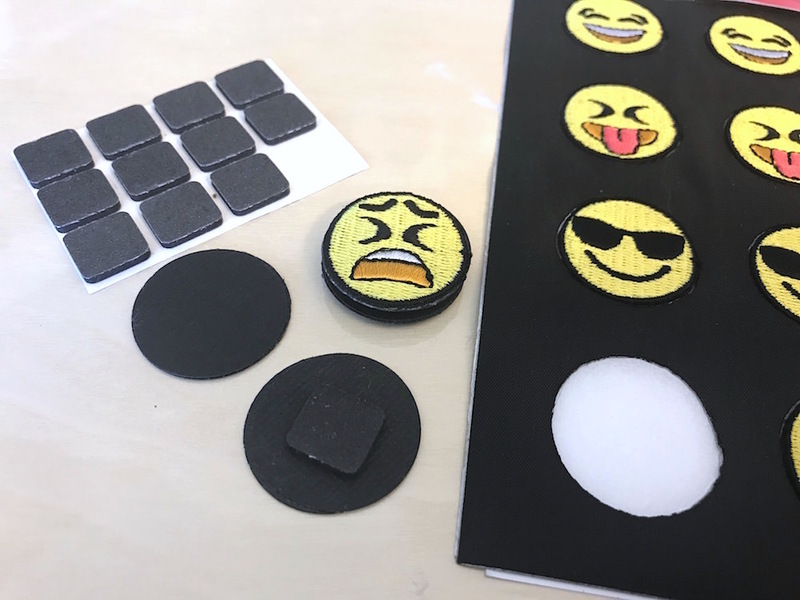 Center the pre-drilled holes so the emoji face is upright. 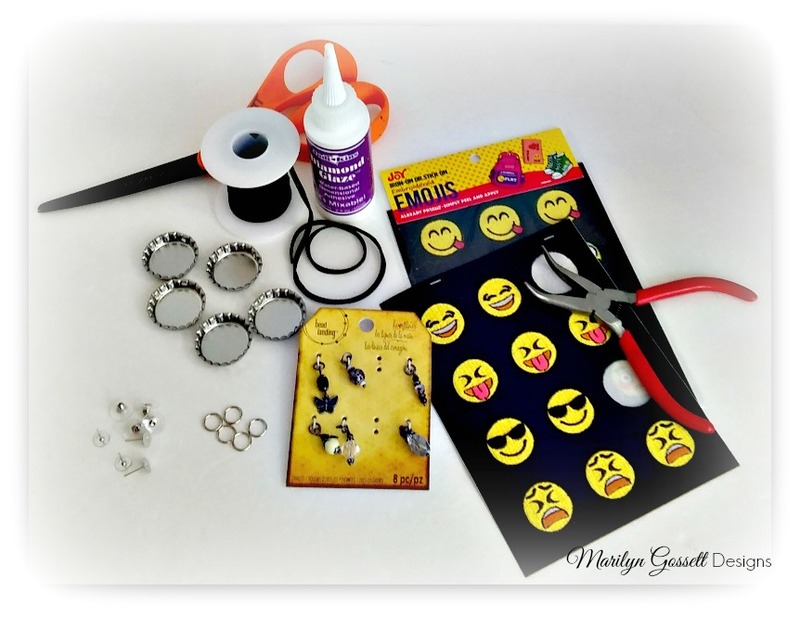 Use the pliers to open a large jump ring and attach it to the top of the bottle cap (emoji head). Close the jump ring. 2. 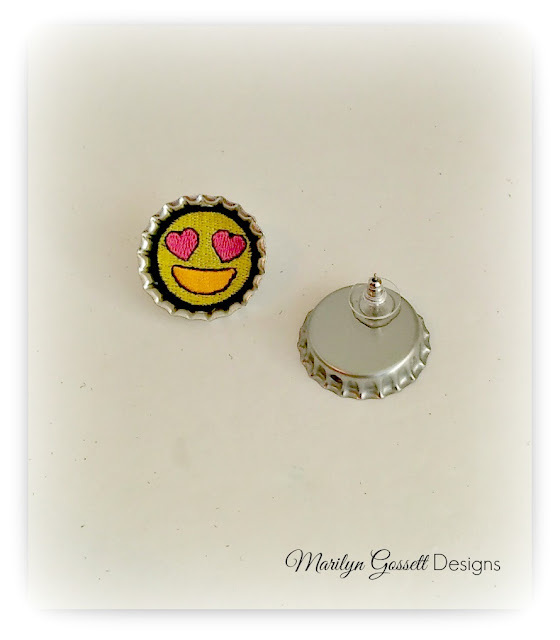 Use jump rings to attach a beaded dangle to the bottom hole in the bottle cap. I used beads that already had a jump ring attached. I used some lobster clasps to attach the beads to the bottle caps. 3. Decide how long you want your necklace to be and cut a length of leather cord. Thread the cord through the jump ring at the top of the bottle cap. Match the ends of the string and tie a knot to secure. 4. 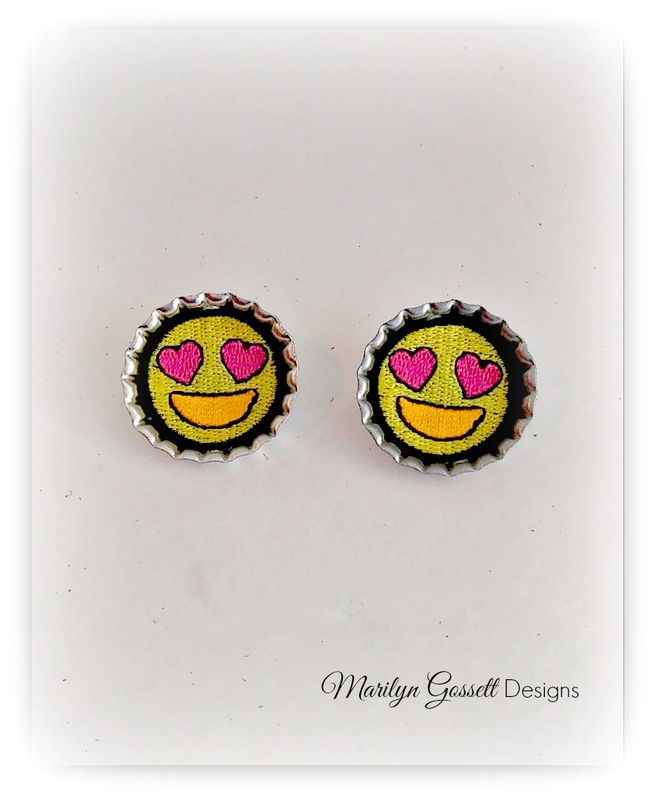 For the earrings, adhere emojis inside a pair of bottlecaps. 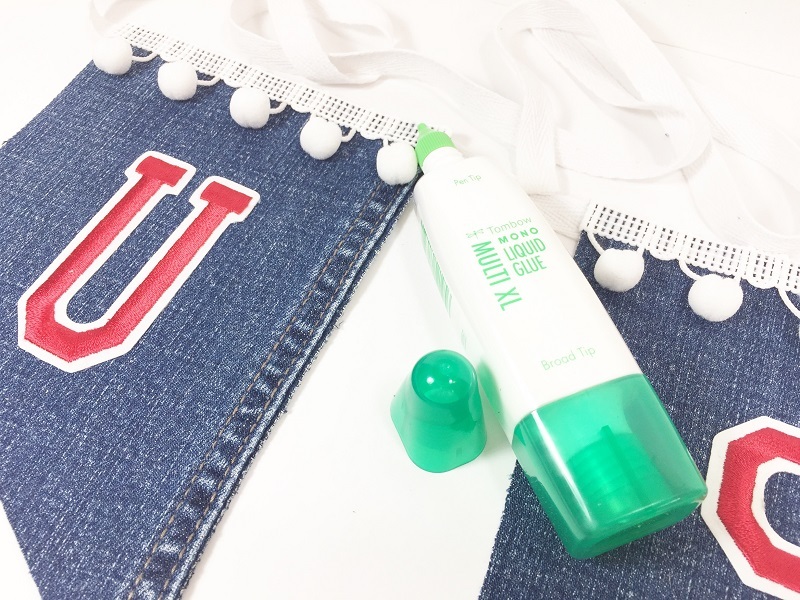 Glue an earring post to the back of the bottle cap. Allow the glue to dry thoroughly. Beads can be added to the earrings too - jazzing them up with some more embellishments makes for even more fun! 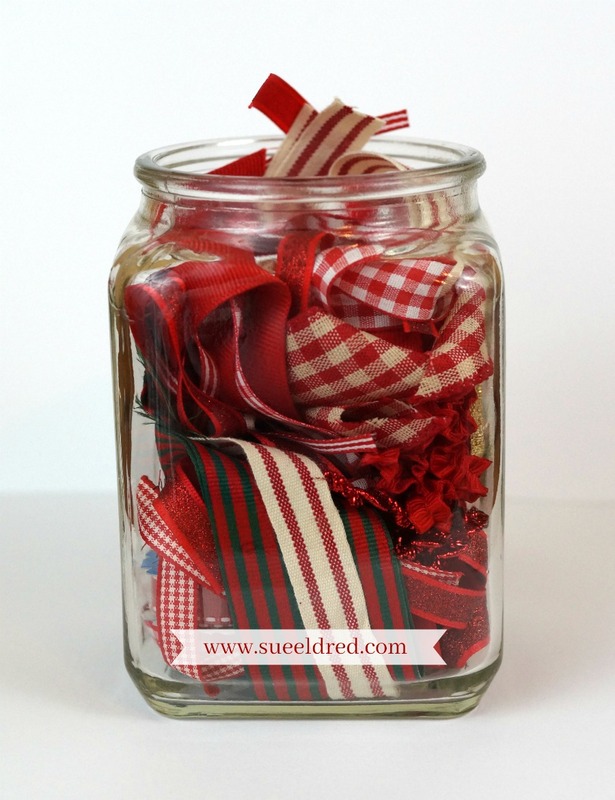 Create this easy children's apron from a dish towel! Choose a checked grid pattern to make it easy to line up the letters. After ironing the dish towel, cut out armholes on one end. Hold up the towel across your child's chest to mark where to cut. Color your letters with a felt pen to match the towel. I left them right on the paper backing while I colored them. 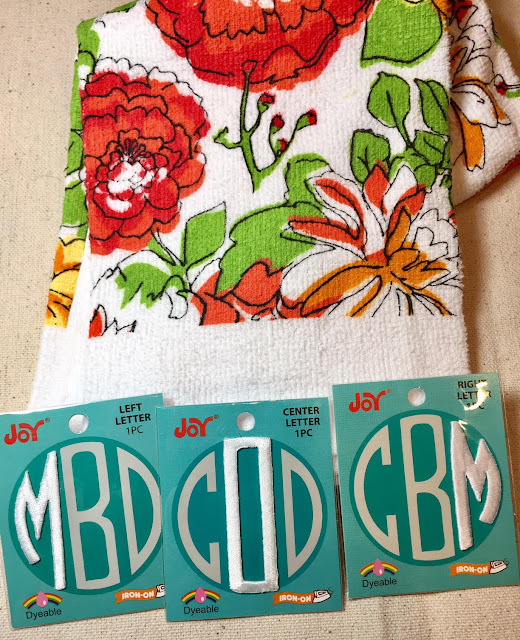 Place them on the towel and iron them on following the instructions on the package. Iron your bias tape, then position it around the arm holes, leaving a loop at the top big enough for the child's head - approximately 14". Glue in place, or pin and stitch if you have a sewing machine. Look for Joy Iron-on letters at a craft retailer near you!